Bailey has been bred to GMPR Dukes True Grit. Duke has been the foundation of True Grit Pointing Labs from the start. Duke was blessed with unbelievable athletic ability and prey drive. He had the point we all strive for in the pointing lab world. Duke had real point, where he was consistently pointing birds from a distance. He was the hardest hunting dog I have ever seen. Duke has always put his tremendous point in his offspring. Bailey is by NAFC FC Cut a Lean Grade (Grady). 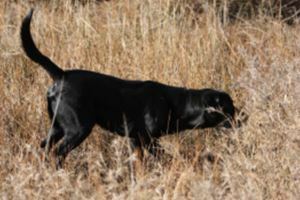 She is an outstanding hunt test dog as well as a great hunting dog. Bailey has been hunted on waterfowl as well as upland game. Bailey has 2 master passes and a JAM in owner/handler Qualifier. Bailey will continue toward her MH this summer. This litter is due March 10th. The puppies will be EIC, CNM, PRA clear by parentge. They will come with TRUE GRITS guarantee.